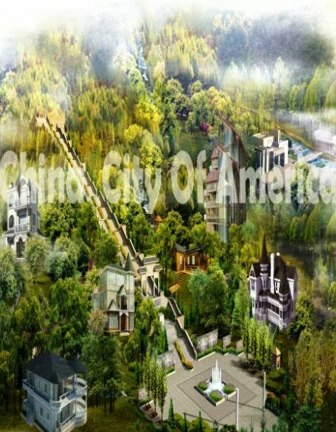 China City Of America is a significant residential, commercial, and resort development being proposed for the towns of Thompson and Mamakating. The Mamakating portion consists of resort development along Yankee Lake and Industrial development along County Rt. 56 and bordering Wurtsboro Hills. The area is in the same vicinity as the proposed Concord Hotel/Casino and Monticello Raceway and Resort being proposed in Monticello. 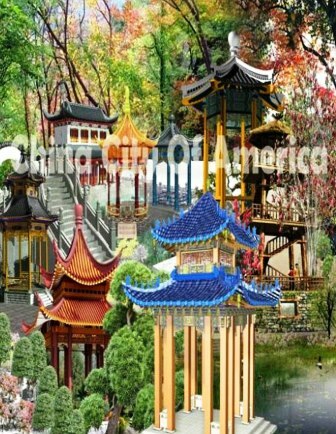 A Long Island businesswoman wants to build a massive “Chinese Disneyland” in the Catskills — which would include an amusement park, huge mansions and a“Forbidden City” laid out according to the principles of Feng Shui. 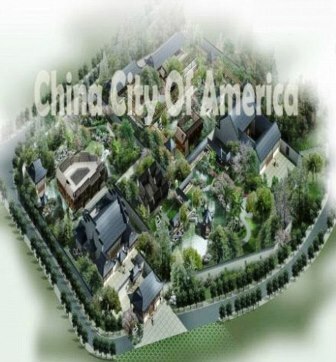 ‘CHINA CITY OF AMERICA’ LOCATED IN CATSKILLS OF UPSTATE NEW YORK: ‘CHINESE CITY’ PROPOSAL BY SHERRY LI WOULD ALSO GRANT VISAS TO WEALTHY CHINESE WHO WOULD INVEST $500K IN U.S.
Residences that are able to host thousands of people collectively make up a big part of the China City of America proposal, as seen by the houses in this impression. 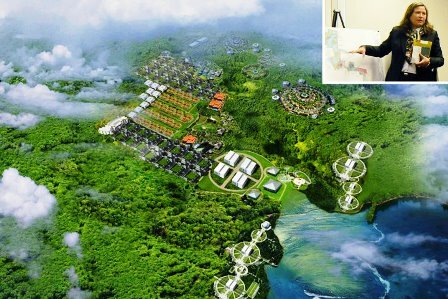 Under the plans, the city will be constructed in accordance with the principles of Feng Shui and each Chinese province will have its own section and offices. The mastermind behind the plan, Sherry Li, says the development would eventually draw $6 billion in foreign investment. “We can kind of view it as a Chinese concept of Disney — so it’s going to have lot of attractions for families,” she said. 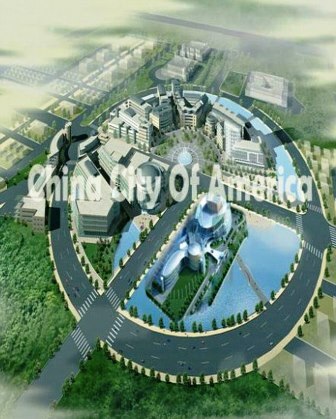 The designs for China City include a college, 1,000 residences, a Chinese-themed retail center and possibly a casino. The place would feel like a trip to China just 90 miles outside New York city, as one area would mark parts of the Chinese Zodiac while another would have 16 buildings representing the major Chinese dynasties. “Each dynasty will have its building and will have rides go with it,” Li said at a town council meeting in May where she pitched the original plan. “It’s multiple phases. No project is going to happen in one day. It’s going to be step-by-step,” Li told the Post, saying the amusement park component would get built in a later phase. The plan is now under consideration by the leaders of Thompson, population 15,000. It’s already getting a lot of opposition. “It actually seems surreal but unfortunately it is real,” said Paula Medley, an activist who heads a local environmental group. “This is kind of a combination of pie-in-the-sky and ethnic solidarity and showmanship and a federal program that sort of facilitates this sort of thing. It’s really an odd mix,” said David North, who authored a new report picking apart China City’s proposal for the D.C.-based Center for Immigration Studies. Others questioned its link to the federal visa program, known as EB-5. The Thompson town council has had at least five meetings on the project, with the latest Tuesday night. Li wouldn’t reveal the number of investors she has lined up, but she said most were Chinese nationals. “It’s in the thousands of apartments, houses — it’s huge,” said Thompson town supervisor Tony Cellini. He said the total population of Chinese coming in eventually could equal the town’s if the developers “fulfill’ all their wishes. “We’re not certain we have the infrastructure to handle all that at this point,” he added. U.S. immigration officials are considering a proposal from Chinese investors to create a multibillion-dollar development in New York’s Catskills called “China City” — raising concerns among critics about the potential cost to U.S. taxpayers and, according to one analyst, the possibility it could be a “stalking horse” for the Beijing government. A spokesman from the U.S. Citizenship and Immigration Services told FoxNews.com that the proposal for Thompson, N.Y., has not been approved but is under consideration. The mysterious proposed development appears to be a step beyond the types of ethnic enclaves scattered throughout U.S. cities, like the Chinatown sections of New York City or San Francisco. The 600-acre “China City of America” is located far outside New York City in upstate New York’s wetlands and is a meticulously planned project, calling for family housing, a college and student residences, among other structures. In addition to needing federal approval, it would likely need a host of state and local permits before ground could be broken. If approved, every province in China would have an office there and foreign investors funding the development would receive green cards for their $500,000 checks under the EB-5 program designed to lure foreign investment, according to the Center for Immigration Studies, a conservative organization staunchly opposed to the project. A detailed report authored by David North, a fellow with the Washington-based group, claimed there is “a charge from within the Chinese community that China City is a stalking horse for the Chinese communist government in Beijing.” He claimed he was told one group raised objections with the USCIS. A review by FoxNews.com of the the China City Regional Center’s website could not confirm such a claim involving U.S. taxpayer money, though there is little English on the site, which is affiliated with a Florida law firm. No one at the law firm could be reached for comment. The U.S. Citizenship and Immigration Services said Wednesday it does not disclose details of pending applications. “The [China City] Regional Center is not approved. An application has been filed and it’s still pending. A decision has not been made on it yet,” Christopher Bentley, a spokesman for USCIS, told FoxNews.com. “With all cases of a request for an immigrations service or benefit, we rely on the information provided and the law to reach a decision on whether it can or cannot be approved,” Bentley said. Local officials did not respond to requests for comment. But a videotape of a public meeting held in Thompson in May, available on YouTube, addressed the proposal and underscored the controversy surrounding the development. Supporters of the project, in an economically depressed area of Sullivan County, say they believe it would offer both a financial and cultural boon to the region. “Families who invest in EB-5 program are normally influential and wealthy families from China. A lot of them are successful business owners or enterprisers. Most of those investors are highly educated and skilled in different fields,” wrote one poster. 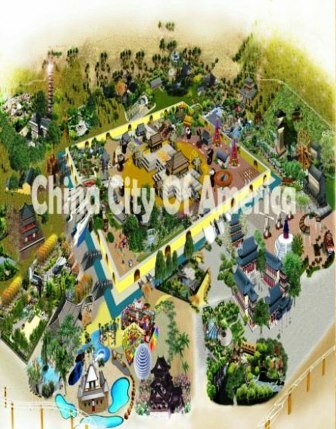 Developer Sherry Li says China City of America would feature a ‘Forbidden City’ (center), as modeled on the historic Beijing landmark, while a theme park styled similar to Disneyland would ‘come later’ in the project. 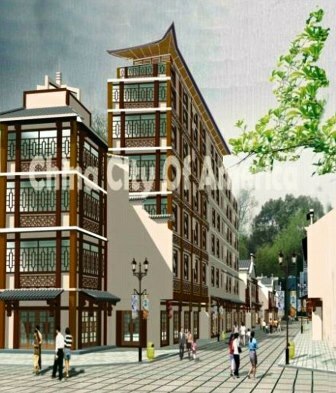 The community: Huge mansion-style homes will be built, according to the plans, to accommodate Chinese nationals who opt to buy into the project. Under the EB-5 visa program, foreigners are permitted a green card if they make a $500,000 investment in the United States. My grandfather always said…. “Never let an opportunity pass you by!” Between the Concord Hotel, Casino & Raceway Resort and the new China City in the Catskills, now is the time to invest in land in Upstate New York! Contact the “Land Expert of Upstate NY”….. This entry was posted in Arts, Culture and Recreation, CATSKILL REAL ESTATE, Catskills, News and Events, Upstate New York Real Estate and tagged Casino, Catskill Casino, Catskill Mountains, Catskills, Century 21, China City, Concord Hotel, Concord Resort, Delaware, Delaware County, Downsville, Kellie Place, Land, land for sale, Monticello NY, Monticello racetrack, Monticello raceway, NY, NY Casino's, properties, racetrack, Real Estate, Thompson, Upstate New York, waterfront property, Yankee lake. Bookmark the permalink.